Shillelaghs are made from the hard and strong wood of the blackthorn tree and they received their name from the Irish town of Shillelagh. The blackthorn tree root forms the knob on the Shillelagh that was historically used as a weapon in Ireland. The Shillelagh is a cudgel or club that was traditionally smothered with butter and hung for months in a chimney to cure. 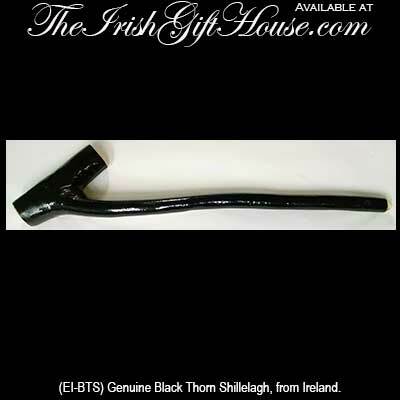 Naturally, The Irish Gift House only offers Shillelaghs that are made in Ireland with wood sourced from Irish blackthorn trees. Shillelaghs are never identical as these Irish clubs are crafted in Ireland from genuine blackthorn wood. This Irish key ring is a genuine miniature Shillelagh that is made from blackthorn wood. A similar, but longer, item that is also made from the wood of Irish blackthorn trees is the Irish walking stick and The Irish Gift House is proud to offer them in three size weights and widths. If you have an appreciation for products that are made in Ireland with materials that are locally sourced you may wish to take a look at our Connemara marble gifts that include the famous worry stones. You may also wish to browse our jewelry collections to see the Connemara marble crosses along with the Connemara marble bracelets. Another consideration is the fine Belleek China whose clay is sourced along the banks of the River Erne in County Fermanagh. We have hundreds of selections that include the Belleek Christmas ornaments along with the Belleek vases.